ElectronicKitSchool. - There are many advantages when you using rain detector alarm to indicate your activity in rainy condition. It is simple example when you wash your clothing in weather season it make your concentration with the raining. With rain detector alarm it will give you information that the condition is raining and need your activity to do something. 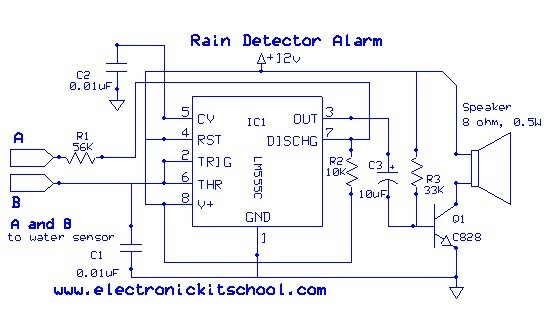 In here, i design one rain detector alarm circuit simply that will help you to detect raining condition. This circuit only need simple and easy electronic component that divided into water sensor, pulse generator, and audio system. 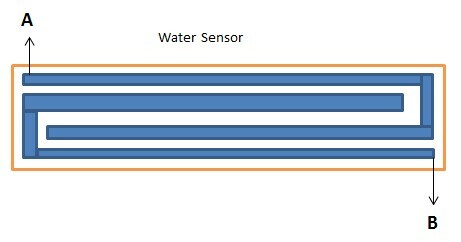 The water sensor build from aluminium part like in Figure 2 below, and the circuit to generate alarm and audio shown like in Figure 1 below. Alarm generate from popular IC this is NE555 as the astable multivibrator. The main goal of this circuit above is give out an alarm when its water sensor like in Figure 2 below is wetted by water. To make the water sensor, it is need the metal to make the sensor come from aluminium and not other like copper. Copper forms have a blue oxide on it is layer on prolonged exposure to moisture. Beside that copper also need us to cleaned regularly and it is not effective for long time using. With the metal that come from aluminium like aluminium foils can be secured to the wooden or plastic board using epoxy adhesive or screw with small size. Now you can use small crocodile clips or small screw to contact A and B from the water sensor to the circuit above. How to place the water sensor? You can begin to place the water sensor with an angle of about 30 – 45 degrees to the ground. This size will make the rain water to flow through it to the ground and prevents the alarm from going on due to the stored water on the water sensor. One again that the main component used in circuit shown in Figure 1 above is using 555 astable multivibrator that will give a tone of about 1kHz upon detecting water. So, when the water sensor after connected to the circuit is wetted by water completes the circuit and makes the 555 oscillate at about 1kHz and the speaker will active to give the load tone.